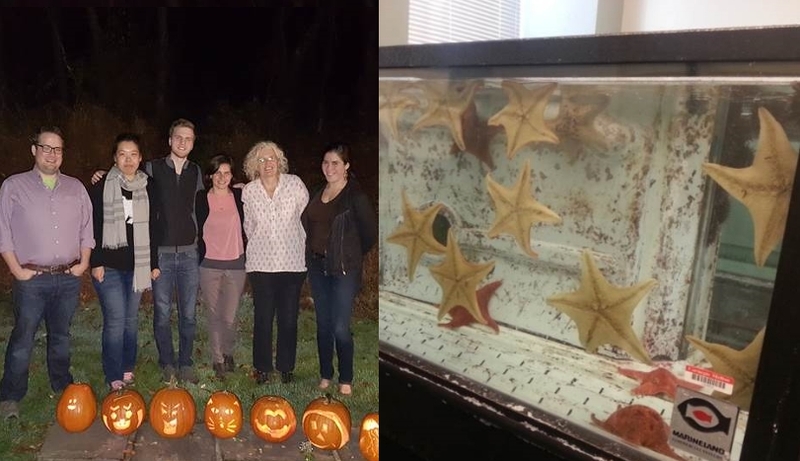 Claudia Cuomo from the Stazione Zoologica Anton Dohrn in Naples, Italy used a Travelling Fellowship from Development to visit Dr Veronica Hinman’s lab at the Carnegie Mellon University of Pittsburgh to learn about the breeding, handling and manipulation of the sea star Patiria miniata at an artificial sea water facility close to the lab. Ensuring she is able to regularly harvest fresh, good quality gametes is crucial to Claudia’s research into the homeodomain transcription factor protein, Xlox, in echinoderms. Claudia also utilised the expertise of the Hinman lab to refine her technique for morpholino injection, successfully knocking down the Xlox gene in 50 sea star zygote samples. A cDNA library of these samples was synthesised from extracted RNA and sent for next-generation sequencing on the Illumina platform at the Laboratory of Molecular Medicine and Genomics at the University of Salerno, Italy, and the results used to compare Xlox protein function between sea urchins and sea stars back at the Stazione Zoologica Anton Dohrn. Additionally, Claudia advanced her skills in ChIP using sea urchin chromatin, and promising genes revealed by the RNA-seq results will be selected for further analysis by ChIP to investigate their ability to interact with Xlox and another homeobox protein, Cdx. A Travelling Fellowship from The Company of Biologists was not only a fast and efficient way for Claudia to progress her sea star experiments, but also a welcome opportunity to visit a laboratory expert in developmental and comparative biology among echinoderms. In addition to help with experiments, Claudia was invited to be part of a lab meeting, where she received advice on her work, and dinner with all the members of the lab forged new and lasting relationships.